VIDEO of George Clooney's nasty road accident has been released. The actor slammed his motorbike into an oncoming car that turned suddenly into his lane on Tuesday and was thrown several meters in the air on the Italian island of Sardinia, according to video of the crash. Surveillance video of the crash, apparently taken by a fixed security video, was obtained by the newspaper Corriere della Sera. It shows a blue Mercedes veering into oncoming traffic apparently to turn into a residential compound near Olbia. The video shows what is reported as Clooney's scooter crashing into the car while another scooter alongside him manages to veer around it. Clooney is thrown over the front of his bike and up in the air before landing on the asphalt, where the car driver and other witnesses come to help. The John Paul II hospital in Olbia confirmed Clooney was treated there and released after a few hours. 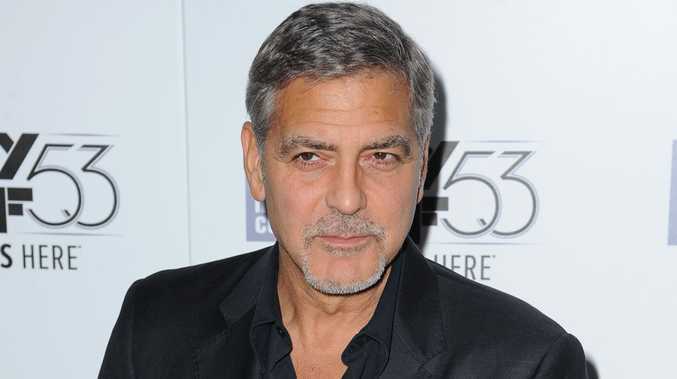 "He is recovering at his home and will be fine," Clooney spokesman Stan Rosenfield told The Associated Press. Clooney was reportedly in Sardinia filming a television miniseries adapted from Joseph Heller's World War II novel Catch-22. He has been staying at a lush, gated rental villa in the high-end Puntaldia neighbourhood on Sardinia's northeastern coast, which overlooks the Tyrrhenian Sea. Staff at the home declined to comment. Clooney is a frequent visitor to Italy. He has a home on Lake Como and was married in Venice in 2014 to the British human rights lawyer Amal Clooney.